We live in a time when having a father in the home is not valued as it used to be. However, it is very clear that despite arguments to the contrary, all children that do not have the influence of a father in their life will suffer some sort of adverse effects. We will look at eight things to consider from the Bible that we should embrace as a father’s mandate. Too often, I encounter families that have a child that is about 12-14 years of age that is having trouble in school due to behavioral issues that have become out of control. Often these parents tell me that their child “fell into the wrong crowd.” After about six weeks of counseling and encouragement to the parents to set the example at home of what is expected for the child, I have to tell them the harsh reality of why their child is having problems. Typically, the problem is not that the child fell into the wrong crowd. Instead, the child has become the wrong crowd. And the child has become the wrong crowd because they are growing up to be just like their parents. Fortunately, many parents earnestly want to learn how to be a better example to their children and make the effort to do so. But, many also lose any interest in improving their example to their child and they soon stop coming for help. A father that is a good example to his children has a strong influence on how the child will live his or her life. Part of a father being a good example to his children is how he demonstrates love to his wife. For boys, this demonstrates to them how they should treat women, which directly influences how he will treat his wife when he grows up. For girls, especially those that are five to 11 years of age, they look to the father figure in their life as a role model when looking for a husband. I have seen this time and time again when a woman goes through broken relationships with bad men and they wonder why they keep picking men that are not good for them. It is often discovered that the father figure in their life as a girl was exactly the same as the men she chooses. A father that shows he loves his wife not only influences his own marriage, but the marriages of his children and even grandchildren. We are told to make prayer a private time with the Lord, not just a meaningless conversation. A fathers needs to have time alone with each of his children so that they can share their hearts. Sometimes it may just be a special time when he takes each of his children out to share an appetizer and a soft drink. Or, it may be doing an activity that each child likes without anyone else. It may even be a special time of prayer together where he can share his heart with his child and his child can do the same. In any case, it must be a time that is set aside for that child alone so that hearts can be shared, which will go a long way toward having the relationship needed in the future when either of them may go through tough times. Too often, fathers make promises to their children that they have no intention of keeping or are nearly impossible to keep. A father must make every effort to keep promises to his children. Many times, I have counseled children where the parents are separated or divorced and the father does not keep his promise to visit his children. Sadly, the pain that is produced with the child does nothing more than teach them not to trust anyone or worse yet, reinforces negative things that their mother may say about their father. Keeping promises, especially in these cases lets the child know that they can count on their father to keep his word, which develops trust. Recently, we have seen displays of young people who melt down at the slightest suggestion of offense. This has given rise to everything from everyone getting trophies in sports to the creation of safe spaces on college campuses where no one is allowed to state an opinion that would hurt anyone’s feelings. Needless to say, helicopter parenting, or not allowing a child to fail in a way where they can learn from their experience, does not allow them to grow to be strong and learn to overcome life’s difficulties. A father that nurtures a child through failure also teaches them that seeking Godly wisdom and advice from a mentor will help them throughout life, even when they are many years older. There are two ways to effect change in anyone’s life. One way is to discourage them through negative and intimidating words. However, this way leads a child to only do what is right if they are made to do right. The other way is to encourage them through positive and inspiring words. Being positive and inspiring is much harder and takes more work, but a child that is trained in this way learns to do what is right from their heart. Fathers should remember that it is easy to be discouraging and tear someone down, but encouraging and lifting someone up is an investment in his family that will pay eternal dividends. When my children were younger, it was not uncommon that they would want to hold my hand when out in public. Sadly today, a father demonstrating any affection toward their child that is older than a toddler is often thought as being creepy. Yet, I have found that especially when it comes to daughters, fathers who do not hug them and show normal parental affection often have daughters that seek affection in boys and young men that do not have their best interests at heart. A father must embrace his children in a way that demonstrates a healthy and normal love for them. For some children, embracing them is the language that communicates that they are loved more than giving gifts or even having a special time doing something. If you notice, the previous seven father’s mandate points had Scripture references. These Scripture references all speak to the love that God the Father has for each one of us. A father that builds his family based upon the word of God uses Scriptures that demonstrate Gods love for us and serves as an example of how to demonstrate his love for his family. In doing so, his actions reinforce his love for God and teaches his family to do the same. We live in a time when having a father in the home is not valued as it used to be. However, these eight things to consider from the Bible that we should embrace as a father’s mandate are just the beginning of many more that God has provided to us in Scripture. Using Scripture as his guide, a father demonstrates not only his love for his family, but God’s love for us, which has eternal dividends. Resources – Scripture quotations are from The Holy Bible, King James Version. 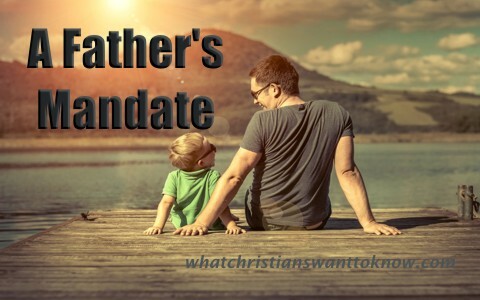 Williams, Michael L. “A Father’s Mandate”. A sermon preached during Sunday morning services on June 19th, 2005. Previous post: Why Is The Tribe Of Dan Missing In The Book Of Revelation? Next post: What Is The Septuagint?